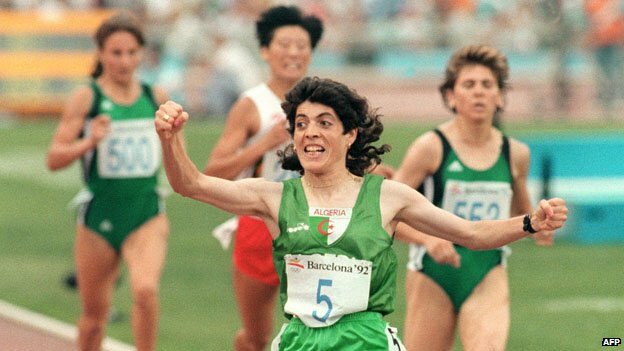 Twenty years ago this summer, Algeria’s Hassiba Boulmerka ran to victory at the Barcelona Olympics. Her achievement wasn’t just her country’s first Olympic gold – she showed women everywhere how they could overcome prejudice to achieve their goals. On the shelves of her spacious office near the capital, Algiers, are dozens of trophies that Hassiba Boulmerka won during her sporting days. Above them hang photographs of her with sporting legends – the Ethiopian long-distance runner Haile Gebrselassie, the British athlete Jonathan Edwards – and world statesmen, including Nelson Mandela. In Algeria, Boulmerka is hailed as the country’s greatest athlete. She took the gold medal for the 1500m at the World Championships in 1991 and Olympic gold the following year. But this was at a time when Islamist militancy was on the rise in Algeria, and some radicals thought the racetrack was not the right place for a woman. She received death threats and in the run-up to the Barcelona Olympics it became too dangerous for her to train in her own country. Boulmerka’s story begins in Constantine, a tumbledown city built by the Romans in the east of Algeria. The fourth of seven children, she began running seriously at the age of 10, in 1978, and soon she was picking up medals at regional, national and international levels. 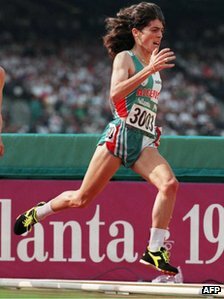 Her big breakthrough came in Tokyo in 1991, when the Constantine gazelle, as she had been dubbed, won the 1500m at the World Championships. “Arriving back in Algiers, we were met by thousands of supporters,” Boulmerka says. She and fellow athlete Noureddine Morceli were driven through the capital in an open-topped car through streets thronged with well-wishers. “The atmosphere was electric,” she says. But Algeria was changing. A botched election in 1992 saw the beginnings of a civil war in Algeria that was to claim more than 250,000 lives. As government security forces battled Islamist militants, Boulmerka, too, became a target. Boulmerka and her family started to receive death threats, graffiti appeared denouncing her as a traitor and she was forced to move to Berlin to continue her training. In the weeks before the Olympic Games, she severed all ties with her family in order to focus on the race. In fact, she says, it wasn’t that difficult to do: the militants had blown up the central telegraph office in Constantine, and all the telephone lines were cut. Boulmerka arrived in Barcelona only on the eve of her races. She had taken a circuitous route via Oslo. The next day she was escorted to the stadium under armed guard. The 1500m final began at dusk on 8 August 1992. To start with, Boulmerka hung back in second place. But with half a lap to go she strode ahead of her rival, Lyudmila Rogacheva, easily beating the astonished Soviet athlete to the finishing line. Standing on the podium later that evening to receive Algeria’s first ever Olympic gold medal, she tried hard not to cry. Her return from Barcelona was nothing like the victory tour she had received the previous year. The country was in the grip of war. She also learned that her father had suffered a stroke and slipped into a coma. 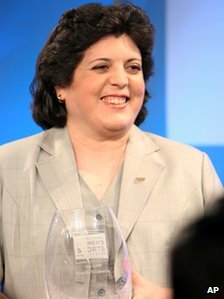 Boulmerka won a bronze medal at the World Championships in 1993, and gold again in 1995. But she never repeated her Olympic victory. For a while she moved to Cuba to escape the threat to her life, but later she returned to Algeria. But eventually she did give up running, and today she is a successful businesswoman. These days, there’s little sign of the Constantine gazelle. “I like to eat well!” she says. She spends a lot of time with her father, who made a slow but full recovery from his stroke. But her sporting achievements will never be forgotten in Algeria. As she sees it, her victory in Barcelona wasn’t just the first Olympic gold for her country. Could coffee become India’s top drink? 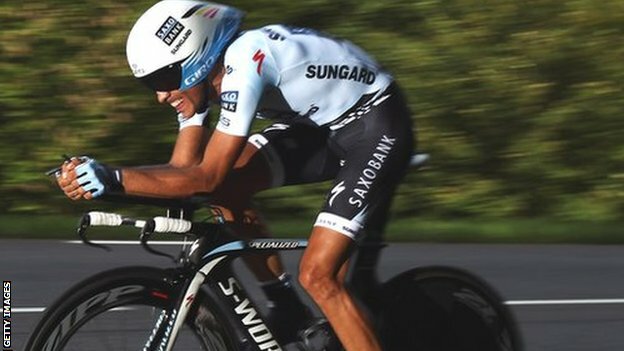 Alberto Contador has described his two-year ban for failing a drugs test as a ‘terrible injustice’. The Spaniard plans to appeal after being found guilty of doping for testing positive for clenbuterol during the 2010 Tour de France. On Monday he was stripped of his 2010 Tour victory and will miss this year’s event and the Olympics. “My feeling of injustice is terrible. I have done everything possible to show that I am innocent,” Contador said. Contador has claimed throughout the process that his positive result was due to eating contaminated meat, but the Court of Arbitration for Sport rejected that defence. On the balance of probabilities, Cas said it believed a suspect food supplement was to blame. Anybody who was expecting Alberto Contador to break down in tears and confess all, or just ride away quietly, can think again. Speaking for the first time since the announcement of his two-year ban for doping, Contador spoke in measured tones but his anger and sense of persecution were obvious. I am innocent but I will not quit, was the defiant message. The Spanish media loved it and chanted his name as he left. He will return but he will not be contrite. Speaking in front of a partisan press conference in Spain where journalists chanted his name, Contador, 29, announced his intention to appeal the decision: “My lawyers are examining the possibilities and as I have said before we have to fight to the end. “I will continue in cycling. I will continue to do so in a clean way as I have all my life. And I know that will make me stronger in the future. Contador thanked people for their support and added: “I’ve had nightmare months when I couldn’t sleep, and months when I wanted to go home rather than ride a bike. His punishment is backdated to August 2010, when news of his failed test was first announced. Contador – widely considered the most gifted racer of his generation – will be free to return to competition on August 6 this year. Earlier on Tuesday, John Fahey, president of the World Anti-Doping Agency, said Contador should now be considered a “cheat”. “The simple fact is that anyone who has a prohibited substance in their system is a cheat,” he said. World No. 1 Novak Djokovic’s incredible five-set win over second-ranked Rafael Nadal was the longest final in grand slam history, lasting five hours and 53 minutes. But where does the marathon clash rank among tennis’ finest title matches? (CNN) — World No. 1 Novak Djokovic has set his sights on a first French Open title after beating second-ranked Rafael Nadal in a epic five-set Australian Open final on Sunday. 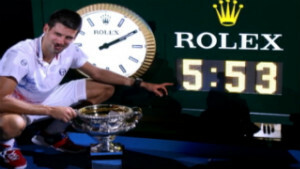 The Melbourne final was the longest ever played in one of tennis’ four grand slams, as Djokovic claimed his fifth major crown and third in Melbourne with a 5-7 6-4 6-2 6-7 7-5 win in five hours and 53 minutes. When asked if this was his greatest win, the Serbian — who has beaten Nadal in the last three grand slam finals — told reporters: “Yes. Right now, yes. “This one I think comes out on the top because we played almost six hours … I think it’s probably the longest finals in the history of all grand slams, and just to hear that fact is making me cry. Can anyone stop champion Djokovic? “I’m very proud just to be part of this history, part of the elite of the players that have won this tournament several times. Australian legend Laver is the last man to hold all four grand slam titles at one time, having achieved that feat for a second time in 1969. Djokovic can match that if he wins the French Open for the first time in June, though his quadruple slam would be in a non-calendar year. The 24-year-old hopes to improve his performance at Roland Garros, where last year he was beaten in the semifinals by 16-time major winner Roger Federer to end a 43-match winning run. “I’m prioritizing grand slams this year, as every year, and the Olympic Games,” the 24-year-old said. “I think that’s one of my highest goals. Djokovic has now won seven successive finals against Nadal, including Wimbledon and the U.S. Open, but he gave due credit to the 2009 Australian Open champion after their marathon match. “Unfortunately there had to only be one winner because we both gave it all. We both put 100% of our abilities on the court and played to the last moment,” he said. After an intensive fortnight of competition, Djokovic said he planned to ban his friends from talking to him about tennis. Kenenisa Bekele is the reigning Olympic 5,000 and 10,000 metres championEthiopia’s Kenenisa Bekele, one of Mo Farah’s main Olympic rivals, has been suspended by his governing body.The Olympic 5,000m and 10,000m champion has been banned from competing, along with 34 other athletes, for not attending a mandatory training camp. The Ethiopian Athletics Federation (EAF) said the ban would be lifted as soon as athletes reported for training. The EAF summoned 200 athletes in November to a training camp in preparation for the World Indoor Championships in March and the London Olympics in July and August. Continue reading the main storyBekele holds the world record and Olympic record in both the 5000 metres and 10,000 metres events. 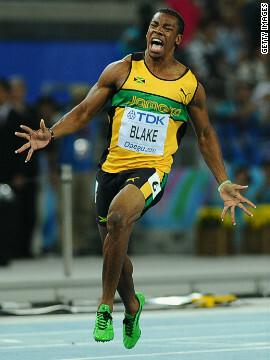 He is the reigning Olympic champion in both events and also won the 2004 Olympic title over 10,000 metres. However, Bekele and 34 other athletes, including Olympic women’s 5,000m and 10,000m gold medallist Tirunesh Dibaba, ignored the call-up. The suspension could in theory prevent Bekele competing at the London Olympics, where the 29-year-old is expected to be a serious threat to Farah in either the 5,000m, 10,000m or both. Bekele’s agent Jos Hermens said: “The situation is a little bit crazy. “I haven’t talked to him yet today, but I know most of the athletes or the coaches have heard about it. “My experience says that [the EAF] will back off. Hermens thinks the EAF is reacting to Ethiopia’s poor performance at the World Championships in 2011 where they finished ninth in the medal table with just one gold. 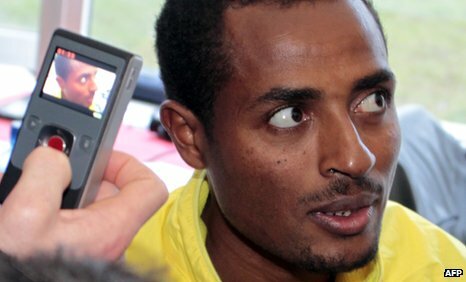 Bekele, who was making his comeback in Daegu after an 18-month injury lay-off, dropped out of the 10,000m after 10 laps. He declared himself fully recovered prior to the Bupa Great Edinburgh Cross Country this month, but finished well down the field. In the latest of our #olympicthursday series profiling leading British Olympic hopes in the build-up to the Games, BBC Sport’s Rob Hodgetts speaks to sailor Ben Ainslie. 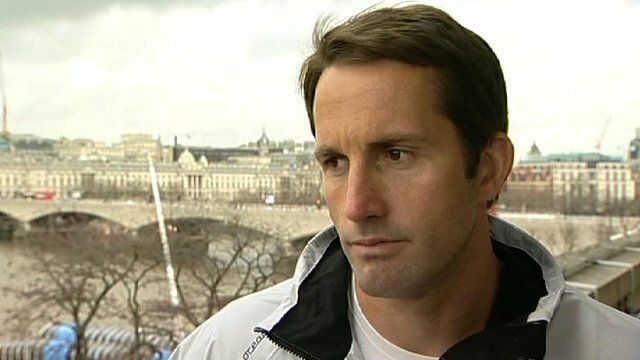 Three-times Olympic champion Ben Ainslie says it would feel ‘amazing’ if he could win a fourth gold medal at the 2012 London Olympics. If Ben Ainslie fails to win a gold medal this summer, something will have gone drastically wrong. The 34-year-old will go into the 2012 Games as the red-hot favourite to claim a fourth straight Olympic sailing title. If Ainslie should triumph in Weymouth, to add to the silver medal he won on his debut in 1996, he will become the most successful Olympic sailor ever, surpassing Dane Paul Elvstrom’s four golds. In Britain’s Olympic medal tally it would put him alongside rowing great Sir Matthew Pinsent and just one gold behind national treasure Sir Steve Redgrave. Cyclist Sir Chris Hoy will renew his Olympic quest this summer on four golds, three of which came in Beijing. “To win selection to the national team is pretty tough and then to win a medal is even tougher,” Redgrave tells BBC Sport. “But to do it over several Games is pretty incredible. A knighthood for Ainslie, then, seems a very likely prospect. Ever the pragmatist, he won’t even be drawn in. “It would be a huge honour but those sorts of thoughts don’t interest me right now,” Ainslie tells BBC Sport. Ainslie, though, enters Olympic year under a cloud. An incident of “gross misconduct” cost Ainslie an almost certain sixth Finn world title in Perth, Australia, in December after he boarded a media boat and remonstrated with the crew, incensed at their proximity to the racetrack. He was disqualified from two races and, despite having built a sizeable lead with no results worse than third in the first eight races, he could not qualify for the medal-race finale, finishing 11th. Ainslie now faces a further tribunal – an independent panel convened by the Royal Yachting Association – in February. In theory, he could be banned from the Olympics but it is unlikely to come to that. Ironically, the title went to Ainslie’s countryman Giles Scott. The 24-year-old is the very man that Ainslie fought off in possibly his toughest selection battle yet to retain the one Finn berth in the Olympic squad after a spell away in the America’s Cup. With no Scott in Weymouth, Ainslie’s task is perhaps that bit easier. His international rivals, though, might see his Aussie antics as a sign they can get under his skin. He insists it has only strengthened his resolve. “Aside from the incident that was one of the best performances of my career,” said Ainslie. “That venue was the worst possible venue for me, being one of the smallest guys in the fleet. I got myself into a position where I had a very strong lead. Ainslie’s reputation as a single-minded competitor has always belied his onshore persona. His dad Roddy describes him as a “placid, ordinary bloke – until he has got a tiller in his hands”. GB Olympic sailing manager Stephen Park agrees: “Ben is considerate and thoughtful onshore, people see him as a gentle giant. Winning multiple medals is fantastic and shows you are on your game. Ben is recognised as being the best sailor in the world and there are probably several events he could helm in but it happens in sailing he’s only allowed to do one. When Michael Johnson was asked about Michael Phelps, who won eight golds in Beijing, Johnson replied that if there were events for running sideways or backwards he, too, would have won more than he did. Multi-medallists at one Olympics always standout and that’s where Ben gets overshadowed. Chris Hoy was amazing but even he wouldn’t say it was more impressive than Ben Ainslie. Ainslie became immersed in sailing from the age of eight after his family moved from Macclesfield to near Falmouth. His fierce drive, he says, stems from unhappy years at school in Cornwall where he was shy, unconfident and bullied. Sailing gave him his salvation. He worked his way up through the ranks and at 18 became the youngest sailor ever selected for an Olympic squad when he got the nod to compete in the Laser class in Atlanta in 1996. One story that captures the essence of the determined young Olympian is when he visited his friend Iain Percy, himself now a two-time gold medallist, at Bristol University. Ainslie came home from a night out and immediately went running at 1am to purge himself. His dedication paid off and he won Olympic silver in Atlanta after a tense final race against Brazilian great Robert Scheidt. Ainslie had refused to bow to Scheidt’s revered status in the fleet and says he was “devastated” not to have won gold. Revenge famously came four years later when in a nail-biting finale he boldly forced Scheidt to the back of the fleet to prevent the Brazilian from securing the finishing place he needed for gold. Scheidt protested – an occupational hazard for the racing sailor – and the rules committee sat into the night, but eventually Ainslie was declared the winner. In Brazil they burned effigies of him and sent death threats. Switching to the heavyweight Finn dinghy, Ainslie’s unwavering focus was again in evidence in Athens in 2004 after he fought back from a disqualification in the first race to claim gold. And he overcame the weight of expectation – he was unbeaten in the Finn in the four years since Athens – and a bout of mumps in China to claim his third Olympic title in Beijing. On home waters this summer Ainslie will be very much a marked man. He says he would not have it any other way. London 2012 has said the Olympic ticket resale system will reopen this week. But Locog, which suspended the resale process on 6 January after technical problems, has not said exactly when the system will be back online. “We have found a solution… that will provide a safe, secure and legal way for people to sell their tickets,” the organisers said. The process was designed to allow people to try to resell their unwanted Olympic and Paralympic tickets. Locog did not confirm that, when the system is up and running, people would be able to buy tickets from the site at the same time. The system is run by Ticketmaster and were unavailable for comment. Those who bought tickets directly from Games organiser Locog should be able to submit their tickets for resale on the 2012 ticketing website until 3 February. The resale window opened on 6 January but problems developed as the site was slow to update sessions which had sold out and the system was closed later the same day. For example, tickets were advertised for the men’s handball semi-finals when the site went live. The tickets were purchased almost as soon as they were made available, but hours later those same tickets were still showing as being for sale. Some people reported that the tickets they selected to buy disappeared when they proceeded to the checkout page of the website. On 9 January Locog partially reopened the site to sell Football and Paralympic tickets. It follows a series of ticketing problems for Locog. The first sales period had to be extended after the site slowed down. In the second round of sales, thousands of people thought that they had bought tickets. They were told the following day that they would not be charged, as they hadn’t actually got any tickets at all. Ten thousand tickets to watch synchronised swimming were put up for sale, yet they did not exist and customers have been offered a swap with seats at some of the Games’ most sought after events like the men’s 100m final. There will be a further chance to resell tickets from April 2012. Police have warned it is a criminal offence to resell London 2012 tickets on the open market without the permission of Locog. In the second of a weekly series profiling leading British Olympic hopes in the build-up to the Games, BBC Olympic sports reporter Ollie Williams speaks to gymnast Louis Smith. Louis Smith gets away with things other gymnasts can’t. He has the Olympic poster-boy looks, a confident swagger and the most difficult routine in the world. He is the face, ringleader and heartbeat of the Great Britain team. Will any of that help him deliver a medal in London this summer? It became more likely when Smith and his team-mates went to Tuesday’s nerve-wracking Olympic test event at the O2 Arena in London and secured space for a full five-man GB team at the Games. Smith, 22, has already enjoyed success at the highest level. He became the first British man to win an Olympic gymnastics medal for a century when he won bronze on his specialist piece of apparatus, the pommel horse, in Beijing four years ago. But his hair, the words he uses and his demeanour set him apart as much as his moves on the pommels. This is by design. Smith wants you to understand he is unique in a sport known for conformity. Smith has had four hours’ sleep. The press adore an unusually expressive athlete and Smith likes talking, so by the time he had extricated himself from the venue – and stopped at a Chinese takeaway next door to his hotel, the only food still on offer – it was 2am. Before 7am he was back inside the arena, live on breakfast television, but this has been his life for years and the Louis Smith look is as neatly groomed as ever. While the hair may change, Smith has a constant reminder tattooed on his back. 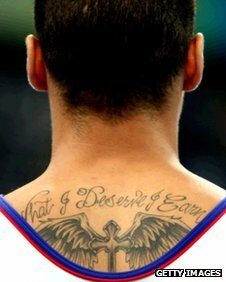 “What I deserve I earn,” it reads above a large image of a winged cross. “I am religious,” he says. “I went to Sunday school, I believe in God – I think I’d be too scared not to. I definitely feel like there’s someone looking over me. Smith’s grandmother passed away just before he appeared at the 2009 World Championships, also staged in London. By then, the younger Smith had already pronounced “gymnastics in this country needs a face”, but he tried too hard to be that face, on and off the apparatus. Confidence became cockiness, assurance verged on arrogance. In the wake of his grandmother’s death, and a humbling fall in that year’s world final, a new mantra took over. “I’ve changed drastically,” he says now. “That was my first major competition after the Beijing Olympics. I was young, it was the first time I’d really felt expectation. There have been more high-profile falls since, but successes too – silver medals at world and European level and pommel horse bronze at the 2011 World Championships in Tokyo, where a heroic attempt to pull off the world’s hardest routine met with failure only in the final seconds. Smith’s prominence may seem odd, given his team-mates compete on all six pieces of apparatus, compared to his one. However, he believes his role in the team transcends his own results. “I’ve learned to respect each competition but have fun with it, and I bring a more relaxed approach to the team. I think if I wasn’t here, the emotions would get on top of everyone,” he says. “I do a good job of cracking a joke when I need to, taking the mick and letting the team feel like, ‘Ah, Louis is still relaxed and having fun, so it’s not such a big competition’. I try to trick them a little bit. Team-mate Dan Keatings, who trains alongside Smith in Huntingdon, certainly does. Nothing has changed two years later. The pair laughed and joked their way around the Olympic test event, in spite of the tension and the nerves to which Keatings confessed beforehand. 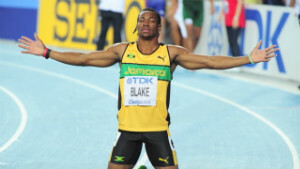 Smith will need his team-mates as much as they need Smith at London 2012. For all his media-savvy front and considerable experience, Smith – a one-time X Factor hopeful – has only one chance to prove Britain’s got gymnastics talent this summer. Standing in his way is Hungarian Krisztian Berki, world champion for the past two years. Berki does the easier routines better than Smith, so Smith’s recourse is to try much harder routines which carry a greater risk of outright failure. “It’s crazy, the amount of difficulty we can put in,” Smith says of the work he and coach Paul Hall have done to maximise the marks he can score. “But it’s about managing that, preparing in the right way and being able to get through that routine. I’m 22, I’m young, but I’ve been around the block. I’ve done a load of routines and made a few mistakes in the past.